ADEXGO Kft. 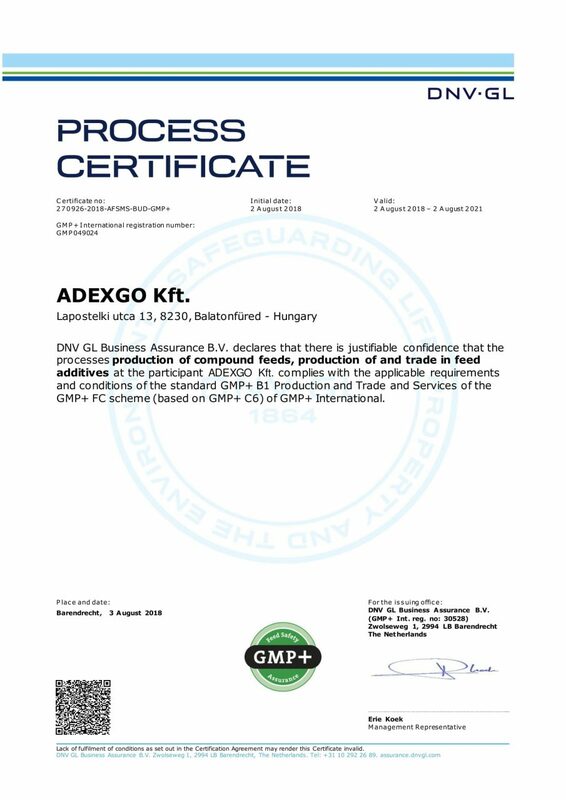 is GMP+ certified - Adexgo Kft. Recently, the GMP+ feed safety assurance scheme has been introduced in our manufacturing plant and business. In July 2018, ADEXGO Kft. closed a successful audit and obtained the „GMP+ B1 Production and Trade and Services” certificate. Whether it is production, sales or other services, GMP+, and the ISO 9001:2015 and ISO 14001:2015 standards already established, prove ADEXGO’s commitment to improving feed safety and quality, to design and maintain safe, traceable and verifiable processes. Our established and certified feed safety and quality management systems guarantee the excellent quality of our products in the future.